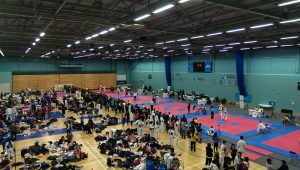 This weekend saw 50 university Taekwondo clubs come together for the 31st annual Student National Taekwondo Championships at the University of Worcester Arena. 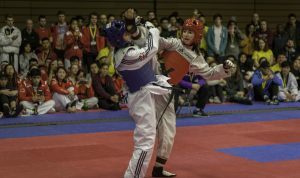 The multi-discipline championships welcomed over 440 university student athletes competing in Kukkiwon, Chang-Hon and Freestyle patterns, as well as ITF rules sparring and WTF rules sparring disciplines, over 2 days of intense competition. The event is renowned for its unique atmosphere. The competitors (loudly!) cheer on their teammates from the first match of the morning to the evening’s floodlit centre court finals, all the while offering warm applause to competitors from other clubs. Every match matters, as each fight won and patterns round progressed awards points towards each club’s overall title total! For the senior divisions, the event is also a pathway to continental competition as the A-class Poomsae, Freestyle Poomsae and WTF rules sparring events are the British Universities and Colleges Sport (BUCS) qualification tournament for the European Universities Championships – the champions league of university sport – with this summer’s event to be held in Coimbra, Portugal. 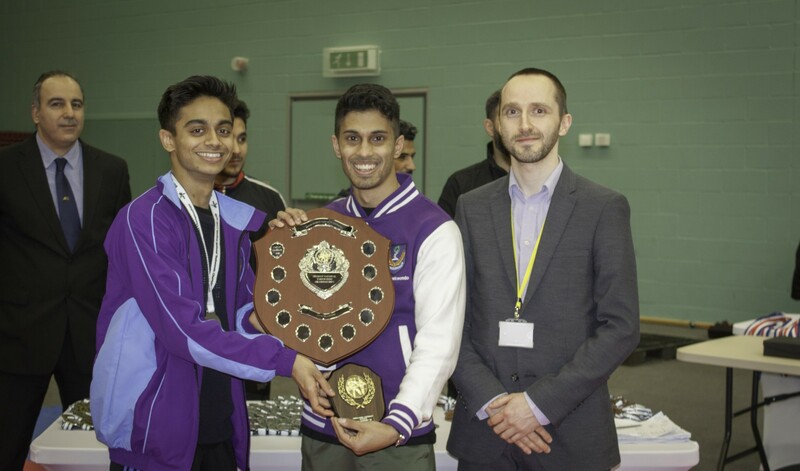 Among last year’s qualifiers were Jacob Barnett of Leeds Beckett University, who went on to win Gold at the EUG in Croatia that summer, and Taylor Shaw from the University of Edinburgh who took Bronze at the Games. 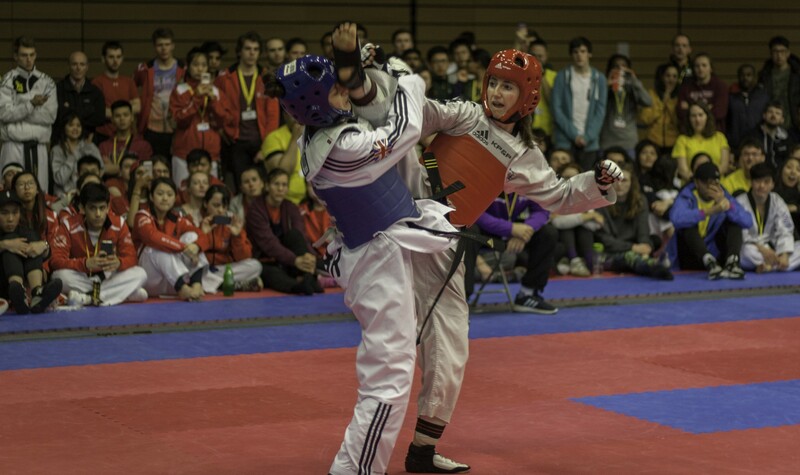 Taylor had returned to defend her student title while Jacob was alas too busy moving into his new home in Manchester as one of the newest members of the GB national team! 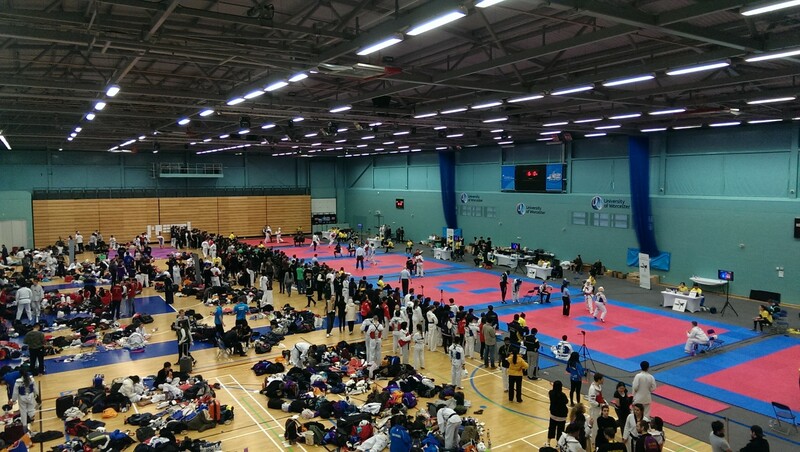 The A-class sparring finals were watched on by hundreds of roaring spectators. Their excitement could have lifted the players into orbit as the athletes squared off to win the coveted tickets to Portugal and the overall team champions title would be decided. 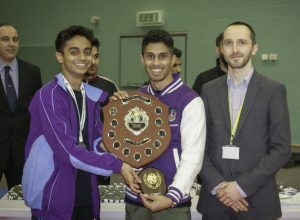 As the dust settled over 30 student athletes from 22 universities had won from their place at the EUC this summer, and University College London Taekwondo Club were crowned as the overall team champions for 2017.